Online testing programs must follow the ongoing evolution of digital marketing to support multiple channels such as social and mobile and to optimize the full customer experience. 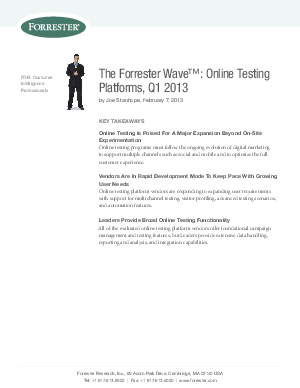 Online testing platform vendors are responding to expanding user requirements with support for multichannel testing, visitor profiling, advanced testing scenarios, and automation features. All of the evaluated online testing platform vendors offer foundational campaign management and testing features, but Leaders provide extensive data handling, reporting and analysis, and integration capabilities.